Two centuries ago today, the only man to assassinate a British Prime Minister was hanged for his trouble. The man at the end of the rope, John Bellingham, was a Liverpool businessman who had gone to Archangel, Russia to do some export/import trade and there been spuriously accused a debtor and slapped in prison for five years. Though others judge more generously of him, Perceval’s overall reputation is that of the prim caretaker, violently anti-Bonaparte, anti-Catholic, anti-adultery, anti-worker, anti-egalitarian, anti-democratic, anti-slavery. Anti- a lot of things. Anti-cluttering up his schedule was the thing that did him in. 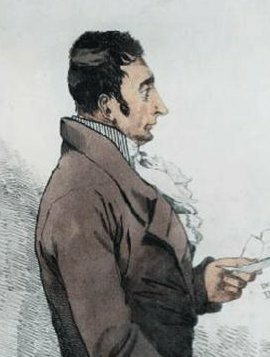 John Bellingham returned from his sojourn in the Romanovs’ dungeons in 1809, understandably embittered over his ordeal and the bankruptcy it had driven him into. He then besieged the government with demands for compensation, but met a cold reception all over and got no reply at all for his request to meet with Spencer Perceval. 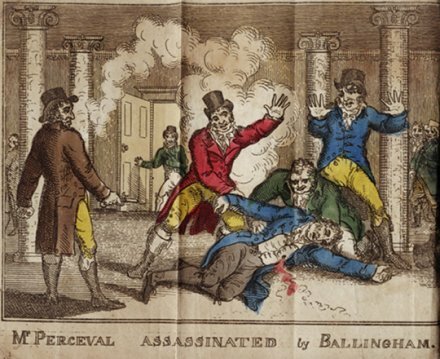 So Bellingham did what anyone would do: he walked up to Perceval at Westminster on May 11, 1812, and shot him dead. Then the strange perpetrator with the private grievance re-seated himself comfortably by the fireplace (rather than exploiting the hubbub to fly), where he was promptly arrested. They didn’t mess around back then: John Bellingham was on trial for his life four days after pulling the trigger. He had, indeed, maintained them openly at trial, bizarrely casting his homicide as a blow for better government to remind ministers of state to keep longer office hours. Finding myself thus bereft of all hopes of redress, my affairs ruined by my long imprisonment in Russia through the fault of the British minister, my property all dispersed for want of my own attention, my family driven into tribulation and want, my wife and child claiming support, which I was unable to give them, myself involved in difficulties, and pressed on all sides by claims I could not answer; and that justice refused to me which is the duty of government to give, not as a matter of favour, but of right; and Mr. Perceval obstinately refusing to sanction my claims in Parliament; and I trust this fatal catastrophe will be warning to other ministers. 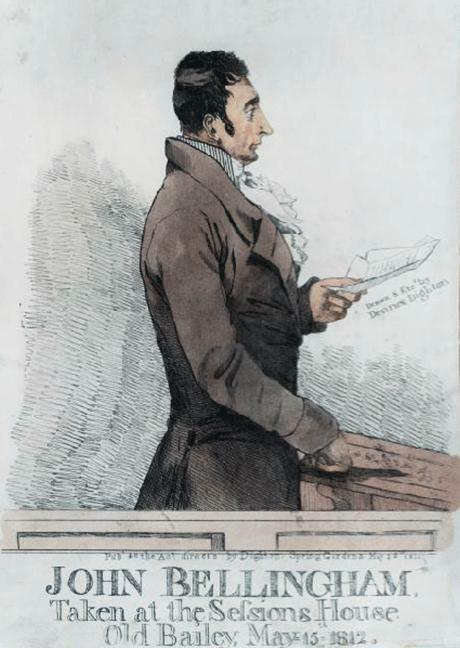 If they had listened to my case this court would not have been engaged in this case, but Mr. Perceval obstinately refusing to sanction my claim in Parliament I was driven to despair, and under these agonizing feelings I was impelled to that desperate alternative which I unfortunately adopted. My arm was the instrument that shot Mr. Perceval, but, gentlemen, ought I not to be redressed; instead of that Mr. Ryder referred me to the Treasury, and after several weeks the Treasury sent me to the Secretary of State’s office; Mr. Hill informed me that it would be useless to apply to government any more; Mr. Beckitt added, Mr. Perceval has been consulted, he would not let my petition come forward. Gentlemen, A refusal of justice was the sole cause of this fatal catastrophe; his Majesty’s ministers have now to reflect upon their conduct for what has happened. Lord Gower is now in court, I call on him to contradict, if he can, the statement I have made, and, gentlemen, if he does not, I hope you will then take my statement to be correct. Mr. Perceval has unfortunately fallen the victim of my desperate resolution. No man, I am sure, laments the calamitous event more than I do. If I had met Lord Gower he would have received the ball, and not Mr. Perceval. As to death, if it were to be suffered five hundred times, I should prefer it to the injuries and indignities which I have experienced in Russia, I should consider it as the wearied traveller does the inn which affords him an asylum for repose, but government, in the injustice they have done me, were infinitely more criminal than the wretch, who, for depriving the traveller of a few shillings on the highway, forfeits his life to the law. What is the comparison of this man’s offence to government? or, gentlemen, what is my crime to the crime of government itself? It is no more than a mite to a mountain, unless it was proved that I had malice propense towards the unfortunate gentleman for whose death I am now upon my trial. I disclaim all personal or intentional malice against Mr. Perceval. * In Peter Plymley’s Letters, which is full of vituperation for Perceval’s harsh Irish policy … words that could go just as readily for many a reputed statesman in many a time and circumstance over the two centuries elapsed since. I cannot describe the horror and disgust which I felt at hearing Mr. Perceval call upon the then Ministry for measures of vigour in Ireland. If I lived at Hampstead upon stewed meats and claret; if I walked to church every Sunday before eleven young gentlemen of my own begetting, with their faces washed, and their hair pleasingly combed; if the Almighty had blessed me with every earthly comfort — how awfully would I pause before I sent forth the flame and the sword over the cabins of the poor, brave, generous, open-hearted peasants of Ireland! How easy it is to shed human blood; how easy it is to persuade ourselves that it is our duty to do so, and that the decision has cost us a severe struggle; how much in all ages have wounds and shrieks and tears been the cheap and vulgar resources of the rulers of mankind; how difficult and how noble it is to govern in kindness and to found an empire upon the everlasting basis of justice and affection! But what do men call vigour? To let loose hussars and to bring up artillery, to govern with lighted matches, and to cut, and push, and prime; I call this not vigour, but the SLOTH OF CRUELTY AND IGNORANCE. The vigour I love consists in finding out wherein subjects are aggrieved, in relieving them, in studying the temper and genius of a people, in consulting their prejudices, in selecting proper persons to lead and manage them, in the laborious, watchful, and difficult task of increasing public happiness by allaying each particular discontent. In this way Hoche pacified La Vendee — and in this way only will Ireland ever be subdued. But this, in the eyes of Mr. Perceval, is imbecility and meanness. Houses are not broken open, women are not insulted, the people seem all to be happy; they are not rode over by horses, and cut by whips. Do you call this vigour? Is this government?